One of the things that drew Mr President to blogging was the idea that he could actually influence others. Being read is one thing, but we’ve all read things only to come away no different to when we sat down to read it. Persuading others is his entire raison d’etre, it is why he became a lawyer. Textual Relations merely serves as a vehicle whereby his pearls of wisdom can reach a wider audience. Regular readers will have seen that he often plugs the Mystery Topic Challenge, hoping, seemingly in vain, to persuade all of you that don’t already to take part in it. Such pleas looked like they were falling on deaf ears until Stella took part last week. Lo and behold, she not only took part but won, which just goes to show that you never know. So why not follow her example and take part? You’ve got to be in it to win it. Mistah President lovez Lolcats. Hoo doesn’t? They’re jus so cute an funny, teh only ting funnir is teh “Pop songs r best representd by grafs” group on Facebook. So when he saw dis quiz he jus had 2 taek it. If u luv Lolcats as mutch as him, it’s only rite dat u taek it 2 show them ur luv. Finkz ov teh poor kittehs! Taek it nao. Comment an let us knoe which Lolcat u r. K bai. One of the things that was raised by the recent feedback was that the Mystery Topic Challenge provides some of Textual Relations’ best material. Yet it also came to light that some readers were wary about taking part themselves. Since he helped to found the MTC, Mr President wants it to be a success. Recently the turnout of participants has been low but the vote count was high last time. Not only is the MTC fun but it is a way to bring more readers to your blog. Try it! One of Mr President’s regular readers, Reasonable Robinson, already signed up. Monday-Meme – What’s Your Philosophical Anthropology? Both of his regular readers will know that Mr President is quite the Philosophy buff so this test was one he just had to take. Yet the result is peculiar. He would certainly list Plato as his favourite philosopher yet “traditional” would not be a word he’d use to describe himself. Orthodoxy? He hates it. Catholicism is the one religion he’s bashed most. He doesn’t even have a religion! Virtues? He thinks people are inherently bad and doesn’t even think that it’s wrong that they are as it’s natural. Were it not for the parts about Plato, about history and a small government he’d just write it off as inaccurate but those are true. What do you think? Is this accurate? What about you, what’s your score? You scored as Classical HumanistYou think that persons are ontologically good but morally bad. You are traditional and orthodoxy is very important to you. You are most likely Catholic, or else your religion is ancient, with a long continuous tradition. You have a good sense of humor and like to take things easy. You aren’t a very exciting person, but are dependable. You think that people need to cultivate the virtues of prudence, temperance, fortitude, and justice. You think that the study of science is good, but don’t often keep up with the products of technological progress. You believe that the study of history has great application to understanding current events. You think that people can govern themselves most of the time, and that government needs to be mainly small; however, you do not expect too much of government. Your favorite philosophers are Plato, Aristotle, Confucius, Marcus Aurelius, Augustine of Hippo, and Thomas Aquinas. Poor innocent Blog Ninjas are dying every day. This is a senseless attrocity that must be stopped and you can help. All you have to do is to sign up to participate in their latest Mystery Topic Challenge. It doesn’t cost you more than a click and a few words. Think of all that Ninjas have done for the world. Building the Empire State building, the Great Wall of China and Apollo 13, as well as inventing coffee, the telephone, and the Sony Walkman. Granted we upgraded to the MP3 player but they invented that too. 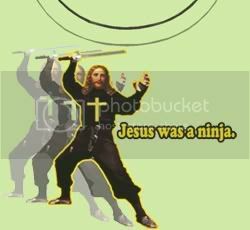 Jesus was a Ninja. So was Elvis. Ninjas even gave us rap music. Just think what kind of world we’d have without Ninjas. Is that what you want? Is it? If not for Mr President, do it for the children. Think of the poor Ninja children. How can you not click here? This is your chance to give back to the Ninjas for all they have done for you. Mr President thought he was an intuitive person. Mr President was wrong. This test not only dispels that notion, but it is also the first to suggest he is actually rather stupid. Which, given how often he clicks the “publish” button instead of the “save” one when writing a blog post may very well be true. Of course that could also be idiotic design by WordPress.com, it’s all a matter of perspective.